Moorestown defeated Burlington Township, 4–1, to win the Central Jersey Group III championship on Thursday. Moorestown’s Julia Darmo shields the ball from a Burlington Township defender. 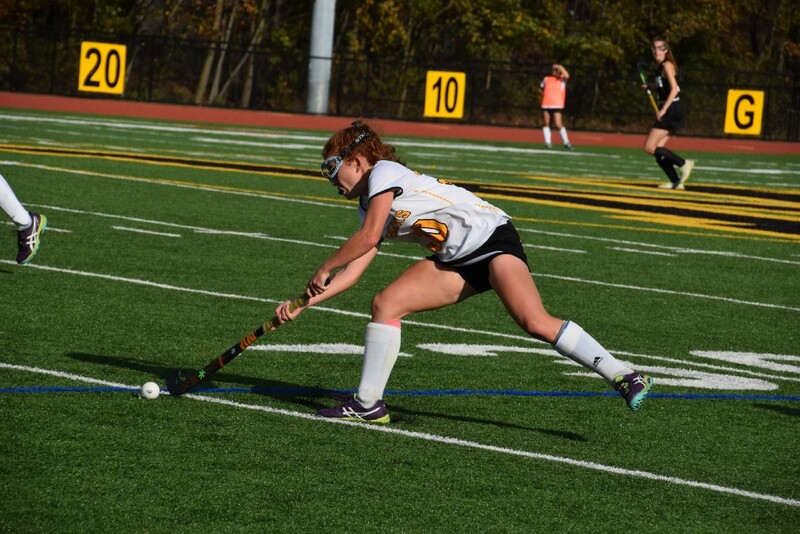 Moorestown High School senior Avery Powell has been a part of a sectional championship all four years of her high school field hockey career. However, she believes the one the Quakers won last Thursday was the sweetest. Moorestown continued its dominance of Central Jersey Group III last week with a 4–1 win over Burlington County Scholastic League rival Burlington Township in the sectional championship game last Thursday. The win gave Moorestown its fourth consecutive sectional championship and its sixth in seven years. The game was much closer than the final scored indicated. The two teams were deadlocked for more than half of the game, with the score knotted up at 1–1 with less than 15 minutes remaining in regulation. The final 15 minutes, however, was where Moorestown buckled down. Collins got her team focused by calling a timeout with 14:44 remaining in the second half and the game tied at 1–1. Moorestown went on to score three goals in the next 12 minutes to seal the win. “It was just about how much we want it and what we’re willing to give to get to the end with a win,” Powell said about the timeout. Colleen Craven prepares to make a pass late in the second half. The winning goal came from junior Colleen Craven, who managed to sweep a rebound into the cage while falling to the turf. Craven’s goal electrified Moorestown and boosted the team in the game’s final minutes. “Coach always tells us to follow through,” Craven said. Moorestown and Burlington Township are familiar foes. The Quakers and Falcons both play in the Burlington County Scholastic League Liberty Division. In addition to playing twice a year in the regular season, Moorestown and Burlington Township have faced off in the playoffs the last five years. The last two years, the Quakers and Falcons have met in the sectional championship. Collins believes Moorestown is battle ready when the postseason arrives because of their tough non-conference schedule in the regular season. 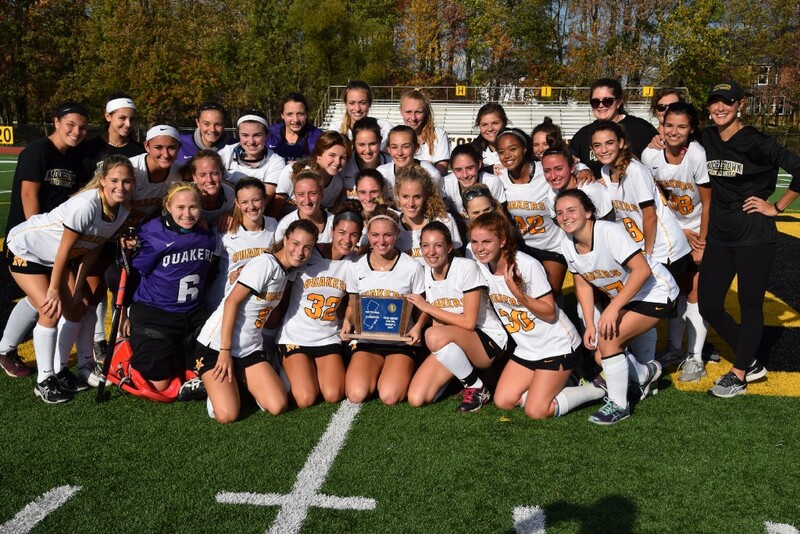 Moorestown improved to 15–3 on the year with the sectional final win, with 2016 state champions Eastern Regional High School and Haddonfield Memorial High School, and 2016 state finalist Rumson-Fair Haven High School. As big as winning the sectional title is for the Quakers, Moorestown is eyeing a much bigger prize. The Quakers have struggled in the state tournament in recent years. Entering the Quakers’ Nov. 7 NJSIAA Group III state semifinal game against Clearview Regional High School, Moorestown hadn’t won a state semifinal game since 2011. Moorestown’s last state championship in field hockey was in 2006. Check www.mooorestownsun.com for the results of yesterday’s state semifinal game between Moorestown and Clearview.